Holiday Unique Vintage Short Sleeve Sweater. Perfect for any Christmas or Holiday Party! 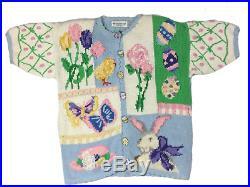 Please see photos of this Fun Sweater. The pictured item is the actual item you will receive. 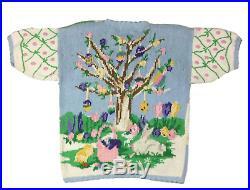 Egg Tree The Eagle's Eye Vintage Sweater Size S US232. This is for a Single The Eagle's Eye Size Small Short Sleeve Sweater. High grade quality that's made to last. Previously owned, but well taken care of. Most Likely One of a Kind. Material: 57% Ramie, 42% Cotton, and 1% other fiber. Assembled in Hong Kong and knitted in China. Has Small shoulder pads sewn in. Please note measurements to ensure proper fit. Please compare to an item you own. Every brand has their own sizing. All measurements are taken with the item laying flat, unstretched. Sleeve Length (Measured from shoulder to end of sleeve): approximately 16. Armpit to armpit: approximately 21. Top of neck seam to bottom of hem (in back): approximately 25. Please remember that due to the limitations of the camera's ability and the relative inconsistencies of various display monitors, the colors you see on your screen may not be a 100% perfect reproduction of the actual item. I strive to depict and describe the colors as accurately as possible, but please understand screen images are intended as a guide only and should be expected to vary slightly. 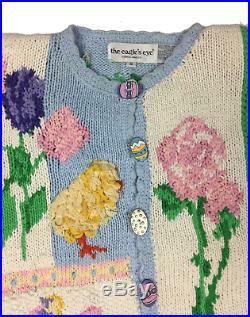 The item "Egg Tree The Eagle's Eye Vintage Sweater Size S" is in sale since Tuesday, December 5, 2017. This item is in the category "Home & Garden\Holiday & Seasonal Décor\Christmas & Winter\Other Christmas & Winter Décor". The seller is "sirholiday" and is located in Higley, Arizona. This item can be shipped to United States, all countries in Europe, Canada, Mexico, Australia, Japan, China, South Korea, Indonesia, Taiwan, Thailand, Hong Kong, Israel, New Zealand, Philippines, Singapore, Saudi arabia, United arab emirates, Qatar, Kuwait, Bahrain, Malaysia, Chile, Colombia, Costa rica, Dominican republic, Panama, Trinidad and tobago, Guatemala, El salvador, Honduras, Jamaica, Bahamas, Uruguay.